We continued refining ideas for the final project, in the computer lab. Some students are well on their way to completing a final project. Some students have yet to select any topic at all....but all project work is due by class on 12 June. For students struggling with selecting a topic, Both Mr. D. and Ms. M. have been directing students towards very discrete ideas, geared to show their mastery of the work, or their capability of demonstrating their mastery. Some students have been urged to analyze their personal results from the Science Buddies website, project wizard. We are done, done, done! Notes are completed! We will move on to speaking of our final projects! We are almost done! One fairly cool demo, done and we continued on into toxins, glutamine, and congeners! Well today saw us all over the place, as we tried to deal with vasopressin (ADH) and/or its deactivation due to alcohol. We went into REM sleep, other means of dehydration / the activity of E. coli in the large intestine, electrolytes ...etc.... But, we managed to bring our questions, stories and work back to page 73 of the notes. There we began to discuss the problems of acetylaldehyde production. Today we began with a review of the chemical activity of aspirin (acetylsalicylic acid or Bayer aspirn), ibuprofen (Advil or Motrin), naproxen sodium (Aleve) and acetaminophen (Tylenol). A quick connection to the negative effects of acetaminophen and alcohol due to the production of NAPQI (N-acetyl-p-benzoquinoneimene) was discussed. We then launched into the 4 major factors regarding the production of hangovers. We began with a quick look at what the possibilities for the final projects . We continued our work on alcohols, and are now looking at the biochemistry of ethanol. We began with what was meant by a drug or drug mixture and ended up, due to a number of questions some students had at the NSAIDs ... and this led us to discussing Reye's Syndrome, inflammation, cyclo-oxygenase 1 and 2, over-the-counter names and compositions, as well as how aspirin helps to keep blood flowing through those occluding arteries. Not a bad day .... Not a bad day at all! Today extended yesterday's work ...and we are focused on the ideas found on page 68 or so of the notes. There are a number of threads to be collected in this part of the unit. While speaking of alcohols, we are also stressing graphical interpretations, solubility and the interactions of molecules and ions (still!!). We re-visited work on Like Dissolves Like, by re-working the chromatography activity, using ethanol (instead of saltwater). We re-worked our grasp of control(s) and variable, as we changed the lab activity. We collected the chromatograms for further work. We continued to develop ideas for final projects, offering up ideas from the electrified boards to tie-dying experiments. Additionally we had some time to talk about pen ink and why it is dissolved in alcohol, why hair spray can be used to get out ink stains, why caps need to be on nail polish remover, and that different molecular structures affect what we smell. Questions on toothpaste and orange juice and tooth sensitivity were addressed as well! Hey! This was one busy day for these science students. A little chromatography work was done today ... We will look at the chromatograms tomorrow and see how these, done with saltwater, compare to the ones done with the solvent, ethanol. We also looked at the skills needed to read a line graph ... We're moving along. Today saw the start of our "special issues" work. The first is the topic of alcohols. The basics of identification and naming were completed. That has brought us up through page 68 of the notes. We graded up the crossword puzzle homework, and then discussed the short-response to be completed. This assignment can be found under the Calendar on the other page. We worked that short response over pretty well. Students were given the prompt and then asked to complete one or more sticky notes by writing down ideas they might include. The notes were then put up on the board to be shared. Mr. D then emphasized that a positive approach might be to address the "What, When, Where, How" of the two parts of nerve transmission. We discussed future topics in class, and went over the homework. A crossword puzzle was handed out as an assignment. Today we began our work on synaptic nerve transmission ...as the "part 2" to our nerve transmission work. The new note packet was given out. The capstone essay topic was also given out, in advance of the assignment. Students will be asked to write about their grasp as to how nerve transmission meshes with our work on organic molecular compounds and ionic compounds and/or electrolytes. Today we tried to put the ideas of resting potential, depolarization and repolarization together, and in picture-form. We ended up using the metaphor of flipping a book bag (nuggetting) to envision the exchange of Na cations and K cations across the cell membrane. Ms. M worked with the class, looking at the most recent quiz, with a question/answer session. Mr. D picked up the covered areas and linked them back to the working of a neuron. Chris L. asked about the final project and that began a series of questions and observations by teachers and students alike about some of the weirder aspects of our responses (or lack thereof) in light of the nervous system. We should be completing this section soon. We discussed what topics the students would like to learn about, in the next unit. Over the last two days, the conversations in the class have been just terrific. A visitor to the class wanted to come back the next day, just to experience it all over again! We are on page 58 of the notes. We spent a small amount of time with questions for tomorrow's quiz. The bulk of the class surrounded the concept of the lipids of the neuron cell membrane acting as an insulator with the embedded proteins facilitating an exchange of electrolytes. We focused upon the movement of sodium ion and potassium ion, today. So we really worked at conceptualizing the action potential as being propagated by this exchange of ions, and then using energy to re-establish the "resting state" ... So, we have an upper limit to how fast, for instance, we can experience one impulse after another, and this limits the speed of a reaction to a stimulus. What a terrific day. We worked away at the marvels of nerves. We are up to page 57 in the notes. There is a quiz on Friday (25 April) on the vocabulary of compounds. This first day back from break was busy. Work was handed back to students and we had a long talk about ensuring that missed work must be made up or it is scored as a 0. We also spoke about the Student Handbook and the student's responsibility to communicate effectively about missing class and the required work. However, since all of the graded work is online, it is very easy to download the work and turn it in. Many are not doing this, and it is affecting grades. We moved away from this point and stressed the value, importance of re-defining key jargon. We used examples from the most recently graded work. It is important to note that students who diligently applied the techniques taught in class, and practiced in class did exceptionally well. Students who did not apply these techniques had varying success. A quiz for Friday 25 April was announced. Students can use a concept map (not "notes ... but a concept map".) It was stressed that teachers will happily help kids develop the map, after school, if the student brings in the vocabulary and issues they hope to include in the map. We talked about the power of making the concept map as a study approach, as well as flash cards. 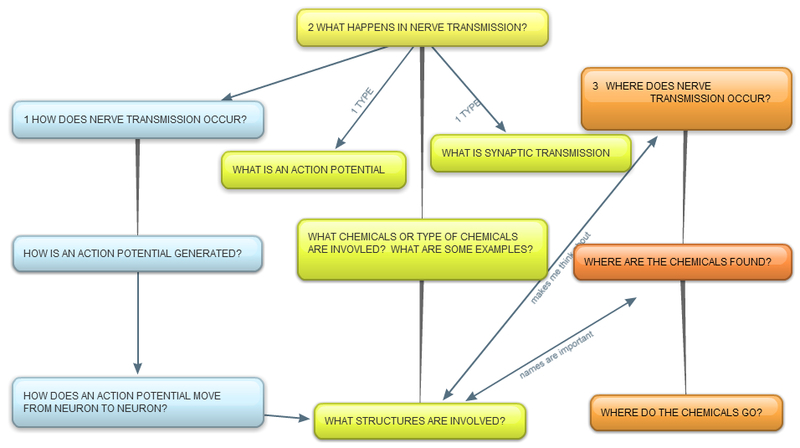 We then began the notes on nerve transmission (see page 2 of the ICLS portion of this website). The questions were awesome ... students asked insightful questions, appropriate clarifying questions and probing questions, forcing the conversation into new and positive directions. Bravo and Brava to every one! An intensive extension of yesterday's work. The assignment (Compound Vocabulary Building (2)) can be found on page 2, under NOTES and LABS. Things are looking quite fine! We quickly reviewed the work and homework from yesterday. The corrected work was handed back. We then briefly reviewed an alternative means of visualizing the information, by showing how personal concept maps can be made. And we have begun the work on: Nerve Transmission. We are using this topic to integrate our work on organic molecular compounds (as represented by cell structural material, and neurotransmitters) ... with our work on inorganic ionic compounds (represented by the electrolyte solutions used in nerve transmission). Today we focused again, on the engaged interpretation of key terms, necessary for our work with compounds. The reasoning behind this process was provided, and then practiced. We also worked on limiting the visual confusion of the printed page, and a few of the students found it helpful. The work is graded and most students turned it in at the end of the period. Other will keep it and turn it in tomorrow, for a grade. The worksheet can be uploaded and students can use the boxes of the concept maps ... rearrange them and build their own concept maps... Try making your own concept maps. After discussing the lab we took the time to hammer out better approaches to analyzing complex data compilations. Students felt far more empowered with the techniques to isolate, systematize, and interpret the data associated with the lab. Any students with a completed lab have the chance to review their write up and attack the questions again ... all due on Monday, 7 April. Today was all about "housekeeping". We reinforced the idea of the latest lab exercise. A demonstration, using sucrose (table sugar) was done today. The goal was to emphasize that some ORGANIC MOLECULAR COMPOUNDS could dissolve in water, but they do NOT produce an electrolyte solution. This was an important distinction. We also spoke about some INsoluble inorganic ionic compounds....but that the lab exercise was focused on the basics ... This lab matches with our upcoming work on the nervous system, for the human nervous systems depends upon a working balance between electrolytes and organic molecular compounds. We spoke about our own well water systems being, essentially, dilute electrolyte solutions, and why they are so. We fleshed out how we are going to finish up the lab work for a few, while the others can begin the write up. That write up is due Friday 4 April. It is to be word-processed and it is online, so you can just cut and paste. Well, the vast number of students completed the unknowns for this week's lab exercise. A few students were absent over the last three days - so on Tuesday, 1 April, anyone can wrap up their experience for full credit, in W-18, at 2:15 p.m.
We stayed true to our schedule and began to work on the unknowns for the lab. We talked about making data tables. We will pick up the lab, tomorrow, as well. Most groups completed Part 1 of the Identification of Organic Molecular Compounds vs. Inorganic Ionic Compounds. We will move onto the unknowns tomorrow. Today we broke down into small groups to read and prepare the Bond Types Lab. Using the information in the theory sheets, students designed a table of predictions comparing the physical properties of organic molecular compounds vs. those of inorganic ionic compounds . Some of the class members worked at integrating our work with concept mapping with the critical attributes in the reading. Now that everyone has a table of predictions, we will test these predictions in the lab. Once there is a fine tuning of these properties, we will look at using this lab as a "standard test" and apply the work to a number of unknown compounds. A copy of the theory sheet can be found on page 2 of the ICLS section of the website. Over the last few days we have been hammering out the differences between organic compounds and inorganic compounds. The focus has been on the properties of the organic compounds, with demonstrations regarding vapor pressure, odor, and combustibility. As recently as today, we attacked some critical reading/writing issues, surrounding the brass lab write up. The expectation that answers are to supported was reinforced. We also focused upon the creation of a concept map, using a fairly complex definition of ionic compound as a reasonable place to begin. 19 March: Amazing conversation about organic compounds ... Everyone seems to be mastering the recognition skills. Folks are mastering the work so well, that we actually could get into a conversation about the meaning of organic farming vs. organic compounds, the activity of THC, and whether or not "natural" can always be interpreted as "good". We are on page 52 of the notes. 18 March: We are up through page 51 of the notes. We have been working on the definitions of and more importantly, the recognition skills for Organic compounds and Inorganic compounds. Today, the newest note packet ( Unit 3 Compounds and Their Vocabulary) was handed out. A link to the MS Word document is on page 2 of this part of the website (Note packets, Calendar Assignments....) We moved right through page 49. We spoke extensively about the power of working through the Key Ideas page (often found at the start or end of chapters in textbooks), and of the power of concept mapping. We worked at analogies for electronegativity, a chemical bond, and the recognition skills for ionic compounds and molecules. What a day! We completed the latest note packet on the elements ... and we are ready to begin our work on compounds ... and then neural transmission. We worked away at completing Identifying Elements, the answers are included on this version. We took the bulk of the class to review for Thursday's quiz. 28 Feb: Using the second page of the student reference tables, we discussed the positions of metals relative to nonmetals on the Periodic Table of the Elements. Group number s and the number of valence electrons were introduced. Student questions again led the discussion. The question of the day first dealt with differentiating between the terms : ions and electrons. A student then posed the question "Can metals and nonmetals exchange electrons and bond to make an ionic compound and is it an ion?" The response was mixed, allowing us to discuss the nature of a metal and nonmetal in a chemical reaction and the octet rule. Metals tend to lose electrons and the nonmetals tends to gain (hence, the work exchange is a bit misleading). However, even though one species loses electrons (and becomes positive), & the other gains it (becoming negative) , the oppositely charged ions bond due to their attractive forces, recouping an overall charge of 0. Thus we could re-investigate the notion that compounds are neutral in overall charge. We also discussed turning in the pink sheets on Carbon Monoxide on Monday. Well one of the students led off the class regarding the poisonous nature of carbon monoxide, and off we went ... from ions of iron in hemoglobin to the (almost) irreversible attraction of CO to hemoglobin. Today we did a fairly intensive review of ions and their interpretation, using Ions in Review. There was independent work followed up by some really effective group work. Papers were collected and we then went over the work taking questions. Today was a pretty easy day. We moved through course options for juniors moving into their senior year!!! We then completed the elemental analyses of the ocean and of the human body. There are many similarities ... does this help establish the idea that life on Earth started in the oceans? Well we began with Toni Morrison's Beloved, moved onto Hamlet, and I arrested the conversation, before I had a chance to launch into Lear... But it was a good conversation - Folks have some really cool interpretations ...Well we still had 35 minutes or so to examine and analyze the implications of our notes on element abundances (p.41-42 of the note packet). We practiced the analysis of data and pushed what is meant by abundance ... and the system about which you wish to know. Questions from teachers and students ranged from the need for iron due to anemia to elements changing their properties as they combine to make compounds. We used the metaphor the behavior of singles vs. a married/committed couple to help internalize the idea that these changes do occur. The lab write-up and associated contract were both given out and explained. Students who needed to make up the brass lab (and those who wished to continue with it) were urged to show up this afternoon (Tuesday 4 Feb) per the directions on this website. Today we were in lab and it was very successful. Some members of the class made some spectacular product and should be quite proud of their follow through. Some learned the need to pay attention to the directions, and some learned a few skills they never thought they were going to master. So, BRAVA and BRAVO ladies and gents. Any students who were absent from lab, need to show up Tuesday after school for the makeup. We will have some other students in there trying their hand at making even better brass, so you will not be alone! If you cannot attend the makeup session, then you need to make an appointment to complete the laboratory, with me, immediately upon your return. No lab can be made up past one week ... and it may be too late to make up the work. Of course failure to get the work done will be reflected in the grades... So, take on the responsibility, as you agreed to do, at the start of the year. Today we went back to the notes. We worked very hard on the arithmetic proofs for ion charge interpretation. That completed page 39 of the notes. Students completed a closure piece on the topic. Tomorrow we go to W-18 for our Brass Alloy/Alchemy Lab. calcium ion" vs. "milk has calcium" and how marketing / common language can confuse people. Although, we did learn that cereals could (do) have actual iron metal in the mixture. Anyone recall why? ...Hmm... This continued the theme of ions and how to interpret them. Tomorrow we are back to the notes, and onto the alloy (brass) laboratory. Today was the second day of demonstrations involving, at some level, the idea of ions. Today was about ions in water (electrolytes) and the ability to / conditions for conducting an electrical current. Students also had questions about the brass alloy lab, which is upcoming. We discussed whether other metals can be used, and what is meant by galvanizing and electroplating. We had a quick lesson on the carats of diamonds vs. the Karats of gold. The unifying thread in these last few days is for students to experience how a lesson on ions can be a bridging issue to many other phenomena. The understanding of a few basic chemical principles / ideas / definitions, can broaden our integration of the world ... encourage new questions, answer old ones, and allow each of us to take hold of these issues, as opposed to just relying on some "expert", like the teacher. For instance, today's continuing work, about, ions in water conducting electricity, led to a student's question about "How else can an electrical current be conducted?" or "Why do I have to get out of the pool when there is lightning?" to a teacher-made comment that our nervous system works to a large extent on mobile ions ...and one student then asked "So we have electricity going on in us?" ....and another student asked "Can I make electricity out of saltwater, when the lights go out?" ... One topic can bridge to so many others. Today we prepared for the Brass Alloy Lab. This integrates with our work on ions, conductivity, mixtures, elements and compounds.